“Vic there is nothing wrong with your heart? Do you have pain? What’s wrong?” I panicked. My little angel girl looked at me with so much sadness in her eyes…It broke my heart. In my heart I know she is right. I have no words for my child. Only tears and prayers…. Sending my love and prayers – and not just in typing. Dear God, you are enduring so strong. Your daughter is an amazing person to understand her destiny with such patience. There is deep melancholy with Vic’s words about what she has missed in her life. But I see far too much unfairness about so many things Vic did not have! Simply living pain-free is something most people take for granted. Yet even with a life filled with suffering, Vic had such a strong will to live. She defied so many predictions and far outlived her doctors’ expectations. 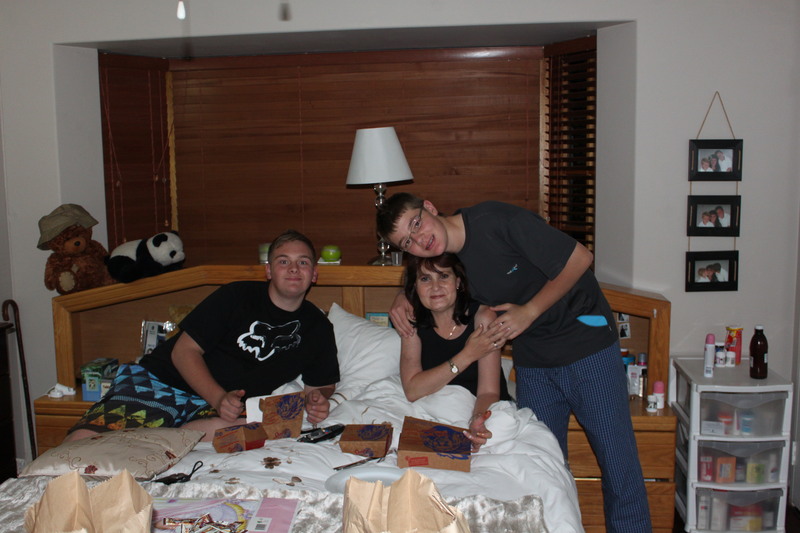 Vic brought two amazing boys into this world; her conviction to do that under the circumstances was unbelievable. She knows they will carry her spirit on. Right now, Vic is evaluating her life in preparation for leaving. Ironically, the closeness that you both share is something unusual and rare. It is deeper than any companionship imaginable – you are of one flesh. Tersia, she is telling you this to help you let her go. She is getting ready to face separating from you– that’s what it is! She is grateful that you have companionship and is reminding you of that blessing when she’s gone. Vic’s desperately wants to be sure that you and her boys will be ok. Keep reassuring her. Is death lonely? It certainly is a solitary journey. But I like to imagine Vic will be soaring free and sailing with god. I pray she sends you a sign of that. Be open to it. I am sending you both a big hug. oh my heart hurts for you all! i understand what she means about being lonely and not having what we all (most of us) want at the end of our life. it is a solitary journey for all of us and yet vic’s desire for that love of our other half. there is no way to give that to her. that must be hell. we all want to give our children what their heart desires and for you not to be able to do that has to be so hard for you. I find Judy’s words particularly wise, and can’t add to what others say. Thank you Lucinda. You always have a kind and encouraging word…. I can’t add to what others say, and find Judy’s words particularly wise. Tears & prayers. My God, this is so so sad, to me. I cannot imagine a doctor saying Daniel would not live to 12, and him making another day, and another… How painful. Enormous. My sincere, deeply felt wishes of well to you, your family. May you enjoy Christmas, God Bless. Next Next post: The end of Maxine….